Not to be confused with Charities. "Charis" redirects here. For other uses, see Charis (disambiguation). "Graces" redirects here. For other uses, see Grace (disambiguation). In Greek mythology, a Charis (/ˈkeɪrɪs/; Greek: Χάρις, pronounced [kʰáris]) or Grace is one of three or more minor goddesses of charm, beauty, nature, human creativity, and fertility, together known as the Charites /ˈkærɪtiːz/ (Χάριτες [kʰáritɛːs]) or Graces. The usual list, from oldest to youngest, is Aglaea ("Splendor"), Euphrosyne ("Good Cheer"), and Thalia ("Festivity"). In Roman mythology they were known as the Gratiae, the "Graces". In some variants, Charis was one of the Graces and was not the singular form of their name. The Charites were usually considered the daughters of Zeus and Eurynome, though they were also said to be daughters of Dionysus and Aphrodite or of Helios and the naiad Aegle. Other possible names of their mother by Zeus are Eurydome, Eurymedousa, and Euanthe. Homer wrote that they were part of the retinue of Aphrodite. The Charites were also associated with the Greek underworld and the Eleusinian Mysteries. The river Cephissus near Delphi was sacred to the three goddesses. Although the Graces usually numbered three, according to the Spartans, Cleta, not Thalia, was the third, and other Graces are sometimes mentioned, including Damia, Auxesia, Cleta, Phaenna, Hegemone, Peitho, Paregoros, Pasithea and Charis or Cale. An ancient vase painting attests the following names as five: Antheia ("Blossoms"), Eudaimonia ("Happiness"), Euthymia ("Good Mood"), Eutychia ("Good Luck"), Paidia ("Play"), Pandaisia ("Banquet"), Pannychis ("Night Festivities")—all referring to the Charites as patronesses of amusement and festivities. Verily that he would give me one of the younger Graces. "Hence some have suspected that Homer knew of older Graces as well. Hesiod in the Theogony (though the authorship is doubtful, this poem is good evidence) says that the three Graces are daughters of Zeus and Eurynome, giving them the names of Aglaia, Euphrosyne and lovely Thalia. The poem of Onomacritus agrees with this account. Antimachus, while giving neither the number of the Graces nor their names, says that they are daughters of Aegle and the Sun. The elegiac poet Hermesianax disagrees with his predecessors in that he makes Persuasion also one of the Graces." Nonnus gives their three names as Pasithea, Peitho and Aglaia. Sostratus gives the names as Pasithea, Cale ("Beauty") and Euphrosyne; Pasithea for Aglaia and Cale for Thalia, Euphrosyne is unchanged. The Charites was most commonly depicted in the sanctuaries of other gods, but they did have their own temples as well, and at least four temples exclusively to them are known from Greece. The two main cult centres of the Charites were the town of Orkhomenos (Orchomenus) in northern Boiotia, and the Aegean island of Paros. "There is also a sanctuary to the Kharites [at Elis, Elis]; the images are of wood, with their clothes gilded, while their faces, hands and feet are of white marble. One of them holds a rose, the middle one a die, and the third a small branch of myrtle. The reason for their holding these things may be guessed to be this. 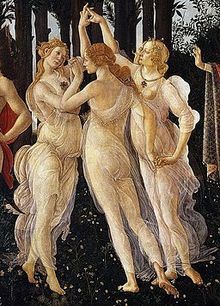 The rose and the myrtle are sacred to Aphrodite and connected with the story of Adonis, while the Kharites (Graces) are of all deities the nearest related to Aphrodite. As for the die, it is the plaything of youths and maidens, who have nothing of the ugliness of old age. On the right of the Kharites is an image of Eros, standing on the same pedestal." "The Boiotians say that Eteokles [king of Orkhomenos, Boiotia] was the first man to sacrifice to the Kharites. Moreover, they are aware that he established three as the number of the Kharites, but they have no tradition of the names he gave them . . . It was from Eteokles of Orkhomenos that we learned the custom of praying to three Kharites. (trans. Jones) [...] At Orkhomenos [in Boiotia] is a sanctuary of Dionysos, but the oldest is one of the Kharites. They worship the stones most, and say that they fell for Eteokles out of heaven. The artistic images were dedicated in my time, and they too are of stone." "Eteokles, one of those who reigned as king at Orkhomenos, who founded a temple of the Kharites, was the first to display both wealth and power; for he honored these goddesses either because he was successful in receiving graces, or in giving them, or both. For necessarily, when he had become naturally inclined to kindly deeds, he began doing honor to these goddesses; and therefore he already possessed this power." "Who it was who first represented the Graces naked, whether in sculpture or in painting, I could not discover. During the earlier period, certainly, sculptors and painters alike represented them draped. At Smyrna, for instance, in the sanctuary of the Nemeses, above the images have been dedicated Graces of gold, the work of Bupalus; and in the Music Hall in the same city there is a portrait of a Grace, painted by Apelles. At Pergamus likewise, in the chamber of Attalus, are other images of Graces made by Bupalus; and near what is called the Pythium there is a portrait of Graces, painted by Pythagoras the Parian. Socrates too, son of Sophroniscus, made images of Graces for the Athenians, which are before the entrance to the Acropolis. Also, Socrates was known to have destroyed his own work as he progressed deeper into his life of philosophy and search of the conscious due to his iconoclastic attitude towards art and the like. 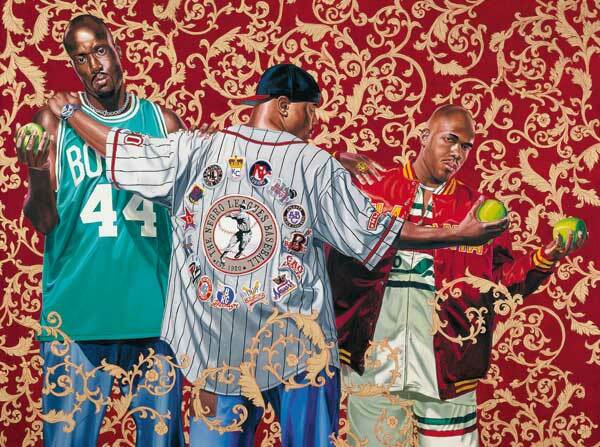 All these are alike draped; but later artists, I do not know the reason, have changed the way of portraying them. Certainly to-day sculptors and painters represent Graces naked." During the Renaissance, the Roman statue group of the three graces in the Piccolomini library in Duomo di Siena inspired most themes. The Charites are depicted together with several other mythological figures in Sandro Botticelli's painting Primavera. Raphael also pictured them in a painting now housed in Chantilly in France. Among other artistic depictions, they are the subject of famous sculptures by Antonio Canova and Bertel Thorvaldsen. A group of three trees in the Calaveras Big Trees State Park are named "The Three Graces" after the Charites. ^ Pausanias. Description of Greece Archived October 2, 2009, at the Wayback Machine, book 9.xxxv.1–7. W.H.S. Jones and H.A. Ormerod, trans. The Perseus Digital Library. ^ ""The Three Graces", Calveras Big Tree State Park". Search3.famsf.org:8080. Archived from the original on 2009-07-24. Retrieved 2010-03-16. ^ "''Allegory of Good Government". Wga.hu. Retrieved 2010-03-16. ^ "ImageBase". Search3.famsf.org:8080. Archived from the original on 2009-07-07. Retrieved 2010-03-16. ^ "''Allegory of April''". Wga.hu. Retrieved 2010-03-16. ^ "detail of ''Primavera''". Wga.hu. Retrieved 2010-03-16. ^ Olga Mataev. "Correggio. Three Graces. - Olga's Gallery". Abcgallery.com. Retrieved 2010-03-16. ^ Olga Mataev. "Raphael. The Three Graces.- Olga's Gallery". Abcgallery.com. Retrieved 2010-03-16. ^ "Three Graces by PONTORMO, Jacopo". Wga.hu. Retrieved 2010-03-16. ^ "ImageBase". Search3.famsf.org:8080. Archived from the original on 2009-07-24. Retrieved 2010-03-16. ^ "''Man surprising Sleeping Venus and Graces". Wga.hu. Retrieved 2010-03-16. ^ "Rubens: The Three Graces". Artchive.com. Retrieved 2010-03-16. 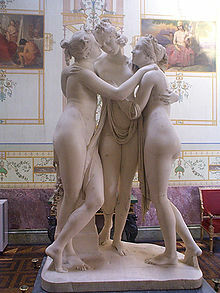 ^ "The Three Graces Dancing by CANOVA, Antonio". Wga.hu. Retrieved 2010-03-16. ^ "''Les Trois Grâces''". Retrieved 2011-09-05. ^ "ImageBase". Search3.famsf.org:8080. 1945-02-19. Archived from the original on 2009-07-07. Retrieved 2010-03-16. ^ "''Three Graces''". Retrieved 2010-03-16. Wikimedia Commons has media related to Gratiae. The Theoi Project, "THE KHARITES"
This page was last edited on 7 April 2019, at 02:58 (UTC).